As I first gripped the Dan Wesson Enhanced Commander Pistol or ECP, it felt like the handshake of an old friend. But on inspection I discovered that friend had received a makeover. Dan Wesson Firearms of Norwich, New York, started more than 50 years ago as a manufacturer of high-quality revolvers. Acquired by CZ USA in 2005, the company has gained a solid reputation in the 1911 pistol market, and the new ECP is the latest proof of that. The Commander name denotes the shortened four-inch slide and barrel, but the gun still retains the full-frame size of the original five-inch Government model. 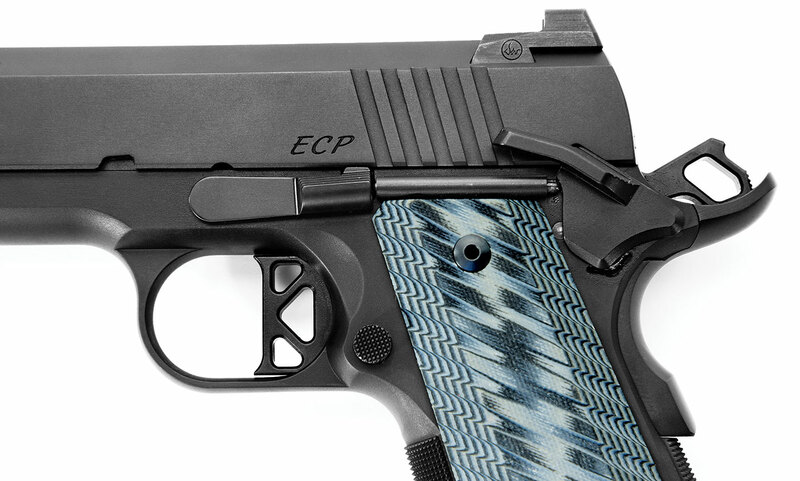 The ECP exemplifies the superior handling and shooting qualities of the 1911 system. The ECP sports a matte black anodized aluminum frame that’s “bobtailed” at the bottom of the mainspring housing. This offers a reduced profile for concealed carry but does not detract from the excellent handling qualities of the pistol. The frontstrap and mainspring housing are machine checkered at 25 lpi and perfectly executed with clean borders on each side. The top of the frontstrap is also undercut at the rear of the trigger guard to help achieve a high grip position. The ECP incorporates an extended safety, and the skeletonized trigger is excellent. The flat face of the rear sight is designed to be used as a racking aid in an emergency. The grip safety is a beavertail type with a “speed bump” at the bottom. This ensures that when the shooter’s hand grips the pistol, the grip safety is depressed far enough forward to unblock the trigger. The fit between the frame and the grip safety is very tight, and there is no excess play or rattle as you might find in lesser-quality pistols. Another addition is a nicely beveled mag well to prevent the magazine lips from catching during loading. Adding to the fit and handling qualities of the ECP is a set of gray-and-black ribbed G10 grips. Locked down by hex-head screws, the grips stand out in appearance and functional comfort. 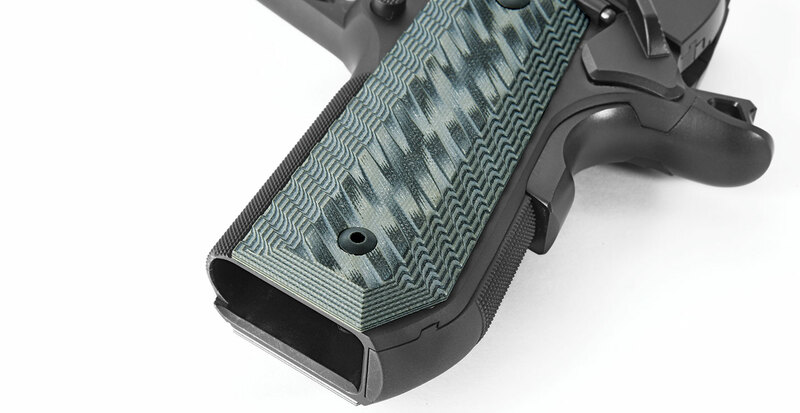 I want grips that keep the pistol firmly locked into my hand, and these textured grips do exactly that. Dan Wesson took this design a step further and tapered the grips at the top to allow for a better fit for different hand sizes. It just felt right from the first. When the grip circumference is too large, too little of the trigger finger is placed on the trigger’s face. As the shooter fires, the very tip of the trigger finger puts sideways pressure on the trigger, moving the muzzle off the line of sight. This results in rounds striking the target to the left for right-handed shooters and the opposite for lefties. Where the grip size and frame design allow the shooter to achieve deeper trigger finger contact, the trigger press travels straight to the rear, which is a big boost to getting center hits on target—as is a trigger like the ECP’s which broke at a crisp four pounds. The combination of the checkered, high-cut frontstrap, bobtailed frame and tapered grips makes for excellent ergonomics. The hammer is a Commander type, but instead of the round hammer extension, it has been modified with an open loop that is angled for both function and looks. The gray/black G10 grips give the ECP a lot of curb appeal, and the trimmed frame corner aids in concealment. The grip safety features a speed bump for sure operation. The checkered magazine catch is slightly longer than found on a standard 1911 and is easily accessed for fast magazine release and reloading. 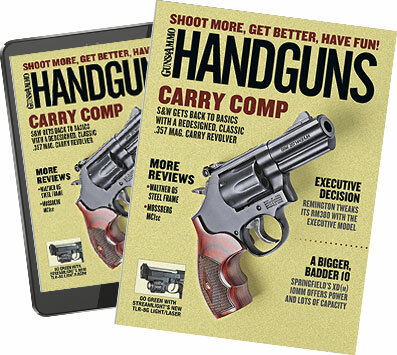 While doing rapid reload drills, the supplied nine-round Dan Wesson magazines—along with Wilson and Brownells 10-round magazines—ejected cleanly from the pistol and slid effortlessly into the frame on the reload. There was zero drag, indicating all frame and trigger dimensions were machined correctly. This is not always the case in 1911s, where grip screws are not trimmed to length or the trigger bow that surrounds the magazine well is not fit flush and one or both intrude into the mag well. With friction against the magazine sides from these parts, the magazine sticks and does not fall free. The shooter must rip out the magazine—inconvenient for a target pistol but a far more serious issue in a handgun carried for self-defense. The ECP has an extended frame-mounted thumb safety that is very positive in operation. It offers a larger surface for easier operation. Most experienced 1911 operators prefer the feel of a positive “click” when engaging and disengaging the safety. This click is the result of the spring-loaded safety detent pressing firmly into the forward edge of the safety. As the safety is rotated up and down from Safe to Fire and back again, the detent snaps in and out of the small countersunk Safe and Fire positions on the safety. If the safety does not have this positive click operation, it can move from Safe to Fire position by the friction of sliding along a car seat or by catching on clothing. The time taken to hand-fit these essential small parts are what sets the quality 1911 pistols apart from others. The slide is stainless steel covered by what DW calls a black matte “duty finish.” The only marking is the ECP logo on the left side of the slide. The rear cocking serrations are wide cut, angled to the rear, and easy to get a solid grasp on to retract the slide. There is a lot of neat design work on the ECP with angles cut into the front and top edges of the slide to give it a semi triangular look. The top sides of the slide angle inwards to form a finely serrated rib on the top of the slide. The overall effect really sets the ECP apart from other 1911 pistols. As one of my shooting partners says, “I don’t have to carry an ugly pistol, and I am not going to.” With the ECP, you have functionality and a unique look. The sights on the ECP include a deep-mounted rear sight that has a 0.148-inch rear U notch and sports the Dan Wesson logo on its left side. The rear sight is press fit into the slide and has an Allen screw locking it in place. 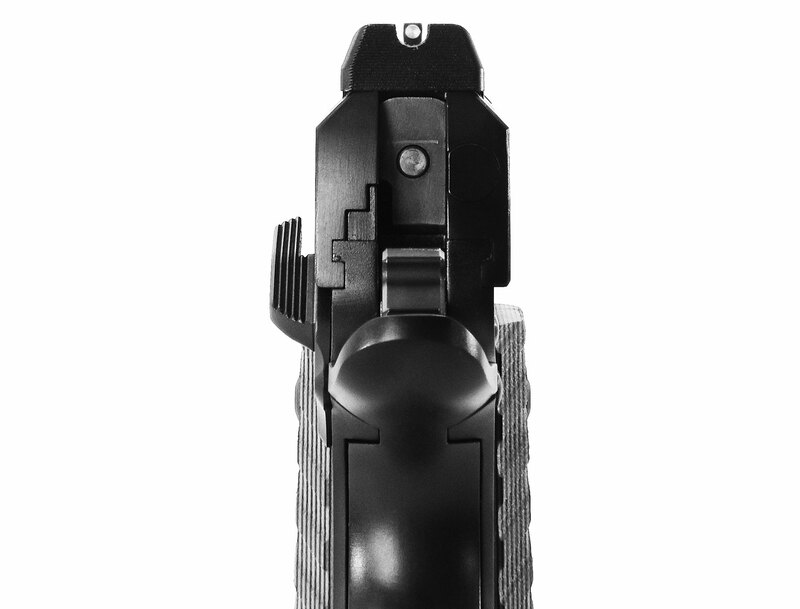 The forward face of the rear sight is square-cut at a 90-degree angle to allow one-hand emergency slide cycling on the holster, belt or other hard edge. At the same time, the rear sight will not snag on draw because all other edges are rounded and clean. The ECP features a U-shaped rear notch, and the front sight incorporates a brass bead that shows up great in sunlight and also in low-light assisted by a flashlight. The front sight is dovetailed into the slide and pinned in place to hold it secure under hard use. It is 0.129-inch wide and has a 0.089-inch brass bead insert. During range work I was able to quickly align the sights on target, the brass bead shining like a beacon in the sunlight. In low light using a flashlight, it also offers a fast visual. The extractor is a critical 1911 component. Dan Wesson chose EGW’s Practical model, which is rated for use up to 70,000 rounds. EGW manufactures top-of-the-line parts, and I’ve been using its upgraded extractors in my carry 1911s. The extractor in the ECP is expertly fitted with proper tension. 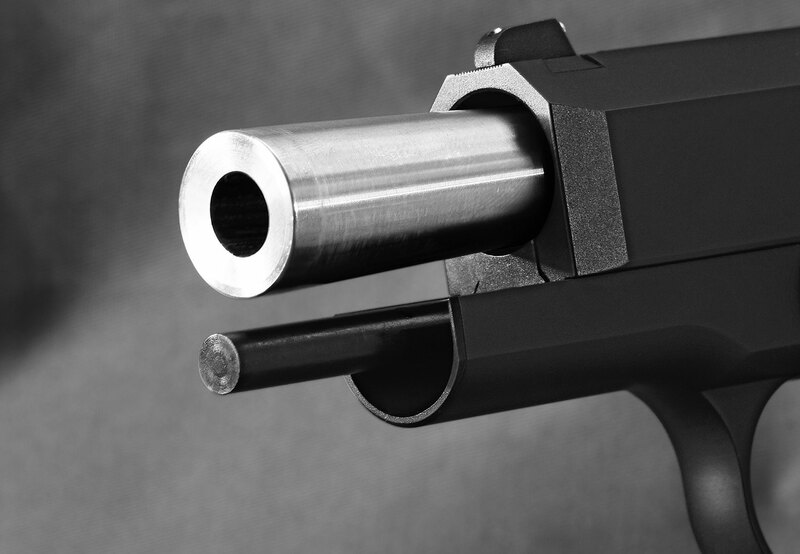 The firing pin is the smaller-diameter 9mm type and uses an extended firing pin spring that increases the safety margin to help prevent an inertia firing-pin discharge should the pistol be dropped on the muzzle. The ECP follows the original 1911 design and has no firing pin safety. The slide-to-frame fit is what you find on custom pistols. There is no play sideways or up and down. Dan Wesson advises in its user manual to lube the ECP liberally and fire 300 to 500 rounds during break-in because it is a tightly fitted pistol. However, in the case of my sample, the slide and barrel slid smoothly into battery from the outset. I would put this level of craftsmanship on par with custom-built 1911s I’ve owned. The four-inch barrel is bright polish stainless steel and marked “MATCH” over the ejection port area. It is a ramped/bushingless heavy bull barrel that puts the weight of the pistol forward, where I prefer it. It has a 30-degree crown to protect the rifling. The integral feed ramp adds to reliable feeding. The bushingless barrel locks up solidly with the slide, and the latter has some good-looking angles cut into it that should make holstering easier. The recoil spring assembly is a flat spring design that Dan Wesson says will stand up to the recoil of 15,000 rounds—three times that of the typical dual-spring system. As it is a bushingless system, the recoil spring guide and recoil spring must be locked together before disassembly. Simply use the bent end of a paper clip and insert it into the small hole in the guide that is exposed when the slide is pulled partly to the rear. The slide can then be removed from the frame and the recoil spring assembly slid out along with the barrel. Dan Wesson’s owner’s manual has excellent photos and guidance in the instructions to do the field strip and cleaning. Even with its lightweight aluminum frame, the 9mm ECP is a pleasure to shoot. The hottest +P loads presented no issues, and recoil was easily managed. I began testing by firing over 600 rounds of Black Hills, Aguila and Remington 115-grain full metal jacket. I then shot another 300 rounds of FMJ match and a mix of the most recent designs in defensive ammo. By the time I completed the testing, I fired nearly 1,000 rounds. When deciding on a carry pistol, reliability must come first, and other than a failure to feed one round early on, there were no operational failures. I also want a highly accurate pistol, and the ECP showed that it can deliver. In the first series of drills, I did rapid-fire strings from seven to 10 yards, and the ECP repeatedly tore out small ragged groups. This is big smile country when you find a pistol that is not sensitive to ammo type and delivers on the essentials. From the bench, two- to three-inch groups were the norm. In a number of cases I put three to four rounds inside of two inches but then would throw one or two, and those might have been on me. Newer Black Hills Honey Badger 100- and 125-grainers were spot on, with four of five rounds cutting each other. The Hornady 124-grain Steel Match HAP was a standout as well. Handgunning is mostly a close-quarter affair, but I am a fan of distance shooting. What would the ECP do on a 10-inch steel plate at 100 yards? Dan Wesson was present at a media event I attended, and the company brought along the ECP, and several us were able to hit the plate repeatedly. While 100 yards is not pistol distance, it does prove the ECP has the right stuff far downrange. Notes: Accuracy results are averages of four, five-shot groups at 25 yards from a sandbag rest. Velocity figures averages of are 10 shots recorded on Competition Electronics chronograph placed 10 feet from the muzzle. 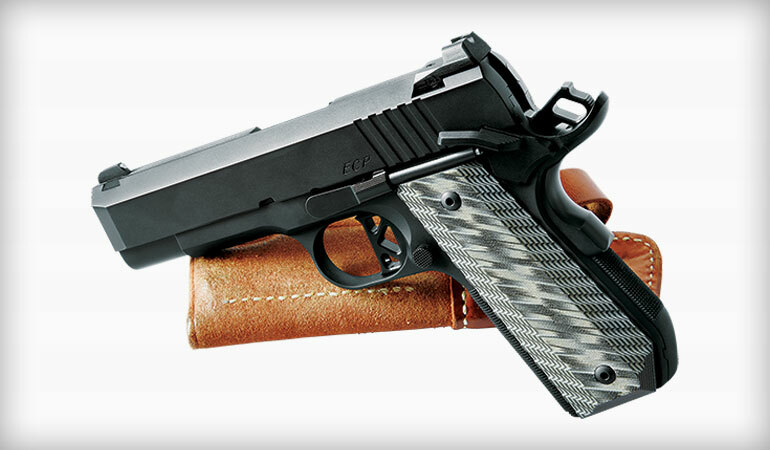 The Dan Wesson 1911 9m ECP is a finely crafted pistol. In all measures of fit, feel and capability, it gets the highest grades. It’s subdued finish and superior craftsmanship is all business. It is an enhanced version of the battle proven 1911, making this a pistol meant to be carried every day. In fact I would say ECP stands for exceptional carry pistol.